In the real world, people on official business are often required to follow strict procedures when dealing with certain situations. Law enforcement officials, for example, are required to “follow protocol” when making enquiries or collecting evidence. In the world of object-oriented programming, it’s important to be able to define a set of behavior that is expected of an object in a given situation. As an example, a table view expects to be able to communicate with a data source object in order to find out what it is required to display. This means that the data source must respond to a specific set of messages that the table view might send. The data source could be an instance of any class, such as a view controller (a subclass of NSViewController on OS X or UIViewController on iOS) or a dedicated data source class that perhaps just inherits from NSObject. In order for the table view to know whether an object is suitable as a data source, it’s important to be able to declare that the object implements the necessary methods. Objective-C allows you to define protocols, which declare the methods expected to be used for a particular situation. This chapter describes the syntax to define a formal protocol, and explains how to mark a class interface as conforming to a protocol, which means that the class must implement the required methods. A class interface declares the methods and properties associated with that class. A protocol, by contrast, is used to declare methods and properties that are independent of any specific class. Protocols can include declarations for both instance methods and class methods, as well as properties. 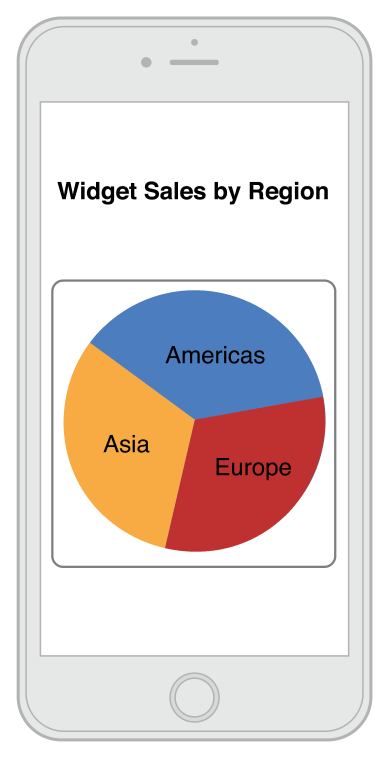 As an example, consider a custom view class that is used to display a pie chart, as shown in Figure 5-1. To make the view as reusable as possible, all decisions about the information should be left to another object, a data source. This means that multiple instances of the same view class could display different information just by communicating with different sources. Note: This protocol uses the NSUInteger value for unsigned integer scalar values. This type is discussed in more detail in the next chapter. The pie chart view class interface would need a property to keep track of the data source object. This object could be of any class, so the basic property type will be id. The only thing that is known about the object is that it conforms to the relevant protocol. Objective-C uses angle brackets to indicate conformance to a protocol. This example declares a weak property for a generic object pointer that conforms to the XYZPieChartViewDataSource protocol. Note: Delegate and data source properties are usually marked as weak for the object graph management reasons described earlier, in Avoid Strong Reference Cycles. By specifying the required protocol conformance on the property, you’ll get a compiler warning if you attempt to set the property to an object that doesn’t conform to the protocol, even though the basic property class type is generic. It doesn’t matter whether the object is an instance of UIViewController or NSObject. All that matters is that it conforms to the protocol, which means the pie chart view knows it can request the information it needs. By default, all methods declared in a protocol are required methods. This means that any class that conforms to the protocol must implement those methods. It’s also possible to specify optional methods in a protocol. These are methods that a class can implement only if it needs to. As an example, you might decide that the titles on the pie chart should be optional. If the data source object doesn’t implement the titleForSegmentAtIndex:, no titles should be shown in the view. In this case, only the titleForSegmentAtIndex: method is marked optional. The previous methods have no directive, so are assumed to be required. This example defines a protocol with three required methods and two optional methods. If a method in a protocol is marked as optional, you must check whether an object implements that method before attempting to call it. The respondsToSelector: method uses a selector, which refers to the identifier for a method after compilation. You can provide the correct identifier by using the @selector() directive and specifying the name of the method. If the data source in this example implements the method, the title is used; otherwise, the title remains nil. Remember: Local object variables are automatically initialized to nil. If you attempt to call the respondsToSelector: method on an id conforming to the protocol as it’s defined above, you’ll get a compiler error that there’s no known instance method for it. Once you qualify an id with a protocol, all static type-checking comes back; you’ll get an error if you try to call any method that isn’t defined in the specified protocol. One way to avoid the compiler error is to set the custom protocol to adopt the NSObject protocol. In the same way that an Objective-C class can inherit from a superclass, you can also specify that one protocol conforms to another. As an example, it’s best practice to define your protocols to conform to the NSObject protocol (some of the NSObject behavior is split from its class interface into a separate protocol; the NSObject class adopts the NSObject protocol). By indicating that your own protocol conforms to the NSObject protocol, you’re indicating that any object that adopts the custom protocol will also provide implementations for each of the NSObject protocol methods. Because you’re presumably using some subclass of NSObject, you don’t need to worry about providing your own implementations for these NSObject methods. The protocol adoption is useful, however, for situations like that described above. In this example, any object that adopts MyProtocol also effectively adopts all the methods declared in the NSObject protocol. This means that any instance of MyClass will respond not only to the methods declared specifically in the interface, but that MyClass also provides implementations for the required methods in MyProtocol. There’s no need to redeclare the protocol methods in the class interface—the adoption of the protocol is sufficient. Note: The compiler does not automatically synthesize properties declared in adopted protocols. Tip: If you find yourself adopting a large number of protocols in a class, it may be a sign that you need to refactor an overly-complex class by splitting the necessary behavior across multiple smaller classes, each with clearly-defined responsibilities. One relatively common pitfall for new OS X and iOS developers is to use a single application delegate class to contain the majority of an application’s functionality (managing underlying data structures, serving the data to multiple user interface elements, as well as responding to gestures and other user interaction). As complexity increases, the class becomes more difficult to maintain. Once you’ve indicated conformance to a protocol, the class must at least provide method implementations for each of the required protocol methods, as well as any optional methods you choose. The compiler will warn you if you fail to implement any of the required methods. Note: The method declaration in a protocol is just like any other declaration. The method name and argument types in the implementation must match the declaration in the protocol. Protocols are used by Cocoa and Cocoa Touch objects for a variety of different situations. For example, the table view classes (NSTableView for OS X and UITableView for iOS) both use a data source object to supply them with the necessary information. Both define their own data source protocol, which is used in much the same way as the XYZPieChartViewDataSource protocol example above. Both table view classes also allow you to set a delegate object, which again must conform to the relevant NSTableViewDelegate or UITableViewDelegate protocol. The delegate is responsible for dealing with user interactions, or customizing the display of certain entries. Some protocols are used to indicate non-hierarchical similarities between classes. Rather than being linked to specific class requirements, some protocols instead relate to more general Cocoa or Cocoa Touch communication mechanisms that may be adopted by multiple, unrelated classes. For example, many framework model objects (such as the collection classes like NSArray and NSDictionary) support the NSCoding protocol, which means they can encode and decode their properties for archival or distribution as raw data. NSCoding makes it relatively easy to write entire object graphs to disk, provided every object within the graph adopts the protocol. A few Objective-C language-level features also rely on protocols. In order to use fast enumeration, for example, a collection must adopt the NSFastEnumeration protocol, as described in Fast Enumeration Makes It Easy to Enumerate a Collection. Additionally, some objects can be copied, such as when using a property with a copy attribute as described in Copy Properties Maintain Their Own Copies. Any object you try to copy must adopt the NSCopying protocol, otherwise you’ll get a runtime exception. Protocols are also useful in situations where the class of an object isn’t known, or needs to stay hidden. If you’re writing an iOS app that uses the Core Data framework, for example, you’ll likely run into the NSFetchedResultsController class. This class is designed to help a data source object supply stored data to an iOS UITableView, making it easy to provide information like the number of rows. Even though you don’t know the class of the sectionInfo object, the NSFetchedResultsSectionInfo protocol dictates that it can respond to the numberOfObjects message.